Sadly Mark passed away just before Christmas 2018. He was diagnosed with terminal cancer after he got secondary cancers from his primary sarcoma tumour which was treated in 2017. Level 4 (behind TV & Audio Department), Grand Central, 2 Station Street, Birmingham B2 4AU. Lifts & escalators within John Lewis Store, Level 4. Wheelchair access; No hearing loop facilities. 450 spaces at Grand Central Car Park, Hill Street Birmingham, B5 4AH with 23 disabled spaces. Many other city centre car parks available. Trains, trams and buses to New Street Station. Thank you very much to everyone that came along to our second West Midlands Sarcoma Support Group meeting on 29th September. We had a great get together and everyone benefited from mutual support, shared experiences and a friendly chat in a relaxed compassionate atmosphere. Thank you also to Helen Stradling from Sarcoma UK for coming along to encourage us as we find our feet as a patient lead group. There was much enthusiasm to keep the momentum going and we are looking to organising a 3rd meeting. Every one agreed that the John Lewis Community Hub at their Grand Central store was very convenient and an absolutely fabulous facility for groups like ours. My name is Mark, I am a sarcoma patient receiving care for a soft tissue sarcoma at the Royal Orthopaedic [ROH] and Queen Elizabeth [QE] Hospitals Birmingham. I was surprised to find that there is no active, patient lead sarcoma support group here in the West Midlands; especially given we have two centres of excellence at the ROH and at the QE. 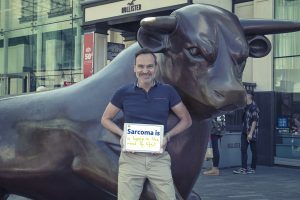 Back in April 2018, I travelled to London to join the London Sarcoma Support Group meeting. It was great to have the opportunity to meet other sarcoma patients in a friendly, compassionate and supportive environment. However, it was a long way and a relatively expensive train fare for a two hour meeting. Now things have moved on, and thanks to the support of other sarcoma patients and Sarcoma UK, the seed has been sown from which our own regional group is growing. This is a patient lead, non-clinical, sarcoma support group meeting, supported by, but independent of Sarcoma UK [www.sarcoma.org.uk – Support Line 0808 801 0401 – supportline@sarcoma.org.uk]. The group is also supported by, but independent of Macmillan staff at Birmingham’s Royal Orthopaedic and Queen Elizabeth Hospitals’ sarcoma centres. If you would like to be part of the group and/or come along to our next meeting please drop me an email message or leave a voice message/text 07949 305 835 – please include your name & contact details.